Bathroom flooring has an important job: standing up to foot traffic from both family and visitors, and resisting dirt and water that gets tracked in or splashed around. You’ll want your flooring to be tough enough for your lifestyle, comfortable enough for your feet, and stylish enough to see every day. Here’s our take on eight types of flooring, rated best to worst for your bathroom. Many kinds of tile, including ceramic, travertine and slate, have qualities that are ideal for bathrooms. They’re durable, waterproof, stylish, slip resistant and long-lasting. In fact, according to a survey by the National Kitchen and Bath Association, ceramic tile bathroom flooring is the preferred choice of 83 percent of respondents! Some tile can feel cold to the touch, but can be warmed up with radiant heating or a rug. Vinyl is one of the most popular flooring options for several reasons: it’s waterproof, stain proof, easy to clean, soft with felt or foam backing, low cost, easy to install, and offers many styles and textures. Choose sheet vinyl over vinyl tiles to help reduce the number of seams where moisture can get through. Engineered wood offers the same great look as solid hardwood, but it stands up better to moisture with greater dimensional stability. It’s constructed with a top layer made of real wood and a bottom layer of plywood. Both options are eco-friendly, comfortable underfoot and ideal for wet environments. Bamboo is durable and easy to install, and cork can be protected with a polyurethane topcoat. Linoleum is available in many stylish options, and can withstand moisture and foot traffic. The drawback is low stain resistance, but that can be solved with a protective coating. Laminate is made with resin paper over a wood chip base. It has a strong wear layer on top and is easy to clean, but the base will warp if it comes in contact with moisture. Install with tight seams to prevent moisture from leaking down the cracks. Hardwood flooring would not be an ideal choice in a humid bathroom due to its tendency to warp or shrink with moisture or temperature changes. However, you may seal hardwood to help combat moisture. Carpet should be one of the last choices considered for a wet environment like a bathroom. In most carpet, moisture will soak in to the fibers and pad and produce mold and mildew. Get the best flooring for your bathroom with Synchrony HOME™. We understand today’s consumers like you want their homes to fit their unique lifestyle, and their home purchases to fit their budgets. The Synchrony HOME Credit Card offers promotional financing* offers ranging from 6 months to 60 months, available at participating retailers, with convenient monthly payments to help you get exactly what you’re looking for. 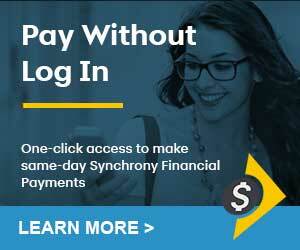 Visit mysynchrony.com/welcomehome to learn more. *Subject to credit approval. Minimum monthly payments required. Promotional financing options available at time of purchase may vary by location. See store for details.